Objective: The study goal was the investigation of relationships between accelerated internationalisation descriptors and antecedent firm- and entrepreneur-related factors in Polish and Czech SMEs. Research Design & Methods: In order to compare Polish and Czech companies, the data collected in two independent studies were used. The study of 233 Polish companies was conducted with the use of CATI method in 2014; 108 Czech companies were surveyed in 2013/2014 with the use of CAWI method. In both samples half of the surveyed SME-exporters were conforming to the accelerated internationalisation criteria. Findings: In both samples the “global vision” elements and company internationalisation scale and speed were interrelated. In the Polish companies this relationship was moderated by company size. There was the lack of strong positive relationships between innovativeness and internationalisation speed and scale in both samples. Implications & Recommendations:The managerial mindset has a decisive role for accelerated internationalisation in both Czech and Polish SMEs. The innovativeness of offering is not indispensable for fast foreign expansion. Larger companies may expand abroad faster if they have internationally oriented managers. Contribution & Value Added:This work addresses a research gap concerning idiosyncrasies of internationalisation antecedents in Polish and Czech enterprises. As the results show, there is no common internationalisation pattern for Polish and Czech SMEs. Almodóvar, P. (2012). The international performance of standardizing and customizing Spanish firms: The M curve relationships. Multinational Business Review, 20(4), 306-330. doi: http://dx.doi.org/10.1108/15253831211286246. Baranowska-Prokop, E., & Sikora, T. (2015). Competitive strategy versus sector specific determi-nants in success perception of Polish born globals. Journal of International Studies, 8(1), 9-21. doi: 10.14254/2071-8330.2015/8-1/1. Cerrato, D., & Piva, M. (2015). The Effect of Global Orientation on the Performance of International New Ventures: Evidence from Italy. Management International Review, 55, 857-883. doi: 10.1007/s11575-015-0255-6. Cieslik, J., & Kaciak, E. (2009). The speed of internationalization of entrepreneurial start-ups in a transition environment. Journal of Development Entrepreneurship, 14(4), 375-392. doi: 10.1142/s1084946709001375. CzechTrade. (2015). ČR se neobejde bez pružného exportu výrobků a služeb. Retrieved on March 10, 2017 from http://www.czechtrade.cz/o-czechtrade/reference/czechtrade-media/cr-se-neobejde-bez-pruzneho-exportu-vyrobku-a-sluzeb-11-11-2015/. Danik, L., & Kowalik, I. (2015). Success Factors and Development Barriers Perceived by the Polish Born Global Companies. Empirical Study Results. Journal of East European Management Stud-ies, 20(3), 360-390. doi: 10.1688/JEEMS-2015-03-Danik. Dasan, P. (2013). Small and Medium Enterprise Assessment in Czech Republic and Russia Using Marketing Analytics Methodology. Central European Business Review, 2(4), 39-49. doi: 10.18267/j.cebr.63. Duliniec, E. (2011). Przedsiębiorstwa wcześnie umiędzynarodowione – uwarunkowania i rozwój. Gospodarka Narodowa, 5-6, 1-20. Evers, N., & O’Gorman, C. (2011). Improvised internationalisation in New ventures: The role of prior knowledge and networks. Entrepreneurship and Regional Development, 23(7-8), 549-574. Ferencikova, S. (2016, December). Selected Firm-Level Internationalisation Theories and the Impli-cations on Central and Eastern European SMEs. Paper presented at the 42nd Annual EIBA Con-ference. Liabilities of Foreignness vs. the Value of Diversity, Vienna. Gabrielsson, P., & Gabrielsson, M. (2013). A dynamic model of growth phases and survival in international business-to-business new ventures: The moderating effect of decision-making logic. Industrial Marketing Management, 42, 1357-1373. doi: http://dx.doi.org/10.1016/j.indmarman.2013.07.011. Gkypali, A., Rafailidis, A., & Tsekouras, K. (2015). Innovation and export performance: do young and mature innovative firms differ?. Eurasian Business Review, 5(2), 397-415. doi: 10.1007/s40821-015-0030-4. Glaister, A. J., Liu, Y., Sahadev, S., & Gomes, E. (2014). Externalizing, internalizing and fostering commitment: The case of born-global firms in emerging economies. Management Interna-tional Review, 54(4), 473-496. doi: http://dx.doi.org/10.1007/s11575-014-0215-6. Główny Urząd Statystyczny (2014). Rocznik statystyczny handlu zagranicznego 2014. Warszawa. Grant, R.M. (1996). Prospering in dynamically-competitive environments: Organizational capability as knowledge integration. Organizational Science, 7(4), 375-387. doi: 10.1287/orsc.7.4.375. Gubik, A.S., & Karajz, S. (2014). The Choice of Foreign Market Entry Modes: The Role of Resources and Industrial Driving Forces. Entrepreneurial Business and Economics Review, 2(1), 49-63. Hånell, S.M., Nordman, E.R., & Sharma, D.D. (2014). The continued internationalisation of an international new venture. European Business Review, 26(5), 471-490. doi: http://dx.doi.org/10.1108/EBR-02-2013-0026. Jarosiński, M. (2013). Procesy i modele internacjonalizacji polskich przedsiębiorstw. Warsaw: Szkoła Główna Handlowa. Karra, N., & Philips, N. (2004). Entrepreneurship goes global. Ivey Business Journal Online, Nov/Dec. Retrieved on March 10, 2017 from http://iveybusinessjournal.com/publication/entrepreneurship-goes-global/. Knight, G.A., & Cavusgil, S.T. (2004). Innovation, organizational capabilities, and the born-global firm. Journal of International Business Studies, 35(4), 124-141. doi: 10.1057/palgrave.jibs.8400071. Knight, G.A., & Cavusgil, S.T. (1996). The born global firm: a challenge to traditional internationali-zation theory. Advances in International Marketing, 8, 11-26. Knight, G.A., Madsen, T.K., & Servais, P. (2004). An inquiry into born global firms in Europe and the USA. International Marketing Review, 21(6), 645-665. doi: 10.1108/02651330410568060. Kokavcova, D. (2016). Rapid internationalization – applying the born global company model in Slovak companies. Proceedings of the Conference Central and Eastern Europe in the Changing Business Environment. (pp. 227-237). Prague: Oeconomica Publishing House. doi: 10.18267/pr.2016.cer.2145.9. Kowalik, I. (2014). Cechy kierownictwa przedsiębiorstw wcześnie umiędzynarodowionych – czynnik sukcesu na rynkach zagranicznych? Wyniki badań empirycznych. Gospodarka Materiałowa i Logistyka, 7(CD), 66-80. Kowalik, I., & Baranowska-Prokop, E. (2013). Determinanty powstawania i motywy ekspansji pol-skich przedsiębiorstw wcześnie umiędzynarodowionych. Gospodarka Narodowa, 4(260), 41-64. Kuivalainen, O., Saarenketo, S., Sundqvist, S., & McNaughton, R. (2012). Internationalization pat-terns of small and medium-sized enterprises. International Marketing Review, 29(5), 448-465. doi: 10.1108/02651331211260331. Lamotte, O., & Colovic, A. (2015). Early Internationalization of New Ventures from Emerging Countries: The Case of Transition Economies. M@n@gement, 18(1), 8-30. doi: 10.3917/mana.181.0008. Lamotte, O., & Colovic, A. (2013). Innovation and Internationalization of Young Entrepreneurial Firms. Management International, 18(1), 87-103. doi: 10.7202/1022222ar. Lopez, L.E., Kundu, S.K., & Ciravegna, L. (2009). Born global or born regional? Evidence from an exploratory study in the Costa Rican software industry. Journal of International Business Stud-ies, 40, 1228-1238. doi: 10.1057/jibs.2008.69. Love, J., & Ganotakis, P. (2013). Learning by Exporting: Lessons from high-technology SMEs. Inter-national Business Review, 22, 1-17. doi: 10.1016/j.ibusrev.2012.01.006. Lukeš, M., Jakl, M., & Zouhar, J. (2014). GEM Global Entrepreneurship Monitor 2013- Podnikatelská aktivita v České Republice. Prague: Global Entrepreneurship Research Association. Retrieved on March 10, 2017 from http://download.mpo.cz/get/50478/57277/612398/priloha001.pdf. Luostarinen, R., & Gabrielsson, M. (2006). Globalization and marketing strategies of born globals in SMOPECs. Thunderbird International Business Review, 48(6), 773-801. doi: 10.1002/tie.20122. Meliá, M.R., Perez, A.B., & Dobón, S.R. (2010). The influence of innovation orientation on the internationalisation of SMEs in the service sector. The Service Industries Journal, 30(5), 777-791. doi: 10.1080/02642060802342679. Mort, G.S., Weerawardena J., & Liesh P. (2012). Advancing entrepreneurial marketing: Evidence from born global firms. European Journal of Marketing, 46(3/4), 542-561. doi: http://dx.doi.org/10.1108/03090561211202602. MPO (2016). Zpráva o vývoji malého a středního podnikání a jeho podpoře v roce 2015. Prague: Ministry of Industry and Trade of the Czech Republic. Retrieved on March 10, 2017 from http://www.mpo.cz/assets/cz/podpora-podnikani/msp/2015/11/Zpr_va_2014_5.11.pdf. Moen, O., & Servais, P. (2002). Born Global or Gradual Global? Examining the Export Behavior of Small and Medium-sized Enterprises. Journal of International Marketing, 10(3), 49-72. doi: 10.1509/jimk.10.3.49.19540. Oviatt, B.M., & McDougall, P.P. (1994). Toward a theory of international new ventures. Journal of International Business Studies, 25(1), 45-64. doi: 10.1057/palgrave.jibs.8490193. PARP Polska Agencja Rozwoju Przedsiębiorczości (2014). Raport końcowy Ewaluacja potencjału eksportowego przedsiębiorstw w Polsce. Warsaw: Polska Agencja Rozwoju Przedsiębiorczości. PARP Polska Agencja Rozwoju Przedsiębiorczości (2015). Raport o stanie sektora małych i średnich przedsiębiorstw w Polsce w latach 2013-2014. Warsaw: Polska Agencja Rozwoju Przedsiębiorczości. Radojevic, P.D., Marjanovic, D., & Radovanov, T. (2014). The impact of firms’ characteristics on export barriers’ perception: a case of Serbian exporters. Prague Economic Papers, 4, 426-445. doi: 10.18267/j.pep.492. Rasmussan, E.S., Madsen, T.K., & Evangelista, F. (2001). The founding of the born global company in Denmark and Australia: sensemaking and networking. Asia Pacific Journal of Marketing and Logistics, 13(3), 75-107. doi: 10.1108/13555850110764793. Rialp, A., Rialp, J., & Knight, G.A. (2015). International entrepreneurship. A review and future directions. In S.A. Fernhaber & S. Prashantham (Eds. ), Routledge Companion to International Entrepreneurship (pp 7-28). New York: Routledge. Simberova, I., & Rekova, E. (2016). Phenomenon of “born globals” in the internationalisation of small and medium-sized enterprises in the Czech Republic. European Research Studies, 19(4), 120-129. Tabares, A., Alvarez, C., & Urbano, D. (2015). Born Globals from the Resource-Based Theory: a Case Study in Colombia. Journal of Technology Management & Innovation, 10(1), 154-165. Wach, K. (2015, September). What Determines Entrepreneurial Orientation of Polish International-ized Firms. Paper presented at the AIB conference International Business and Research in the CEE Region. Why Is It Worth Doing?. Warsaw: Szkoła Główna Handlowa. Wach, K. (2016). Innovative Behaviour of High-Tech Internationalized Firms: Survey Results from Poland. 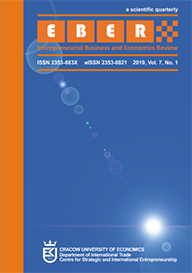 Entrepreneurial Business and Economics Review, 4(3), 153-165. doi: http://dx.doi.org/10.15678/EBER.2016.040311. Zapletalová, Š. (2013). International Management: The Approaches to the International Process of Entrepreneurial Activities of the Czech Companies. Global Virtual Conference Workshop, 1(1), EDIS - Publishing Institution of the University of Zilina. Zapletalova, Š. (2012). The Factors Influencing the Internationalization Process Management of Czech Entrepreneurial Subjects. International Journal of Management, 2(7), 21-29. Zbierowski, P. (2015). Determinanty wczesnej internacjonalizacji przedsiębiorstw. In Raport o stanie sektora małych i średnich przedsiębiorstw w Polsce w latach 2013-2014 (pp. 63-74). Warsaw: Polska Agencja Rozwoju Przedsiębiorczości. Zhang, M., Tansuhaj, P., & McCullough, J. (2009). International entrepreneurial capability: The measurement and a comparison between born global firms and traditional exporters in China. Journal of International Entrepreneurship, 7, 292-322. Zijdemans, E., & Tanev, S. (2014). Conceptualizing Innovation in Born-Global Firms. Technology Innovation Management Review, 4(9), 5-10. Retrieved on March 10, 2017 from http://timreview.ca/article/826.